Eager to learn more about flipped instruction, but not sure where to start? Or maybe you’re already using the flip, but looking for more tips, resources, and techniques to keep upping your game? Existing subscribers to this site received the first edition of this eBook when they signed up to receive our blog posts. 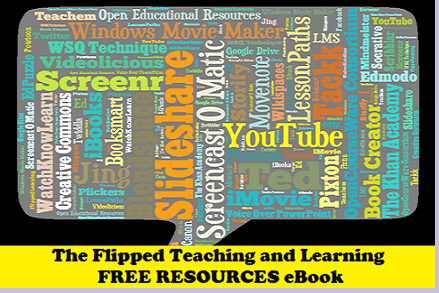 As we headed in 2015, the flipped classroom just keeps growing in popularity and relevance, and I decided I wanted to create a newer, better version of this resource and send it to all existing and new subscribers! I’ve created a deeper, richer eBook that is structured in a way that provides a bit of a mini-workshop of sorts, covering key aspects of quality flipped instruction. I have assembled and published this collection of dozens of excellent free resources to help today’s educators continue their own lifelong learning journey … exploring, evolving, and striving to do the best they can for their students, and their own professional fulfillment. Quality Digital Learning Content – How can you efficiently, affordably turn existing content into engaging digital content, or create new content when needed? And what about the growing volume of excellent learning content resources already available online? We explore both of these options. Successful Delivery & Engaged Consumption – Once you’ve converted, created, or found excellent content, you have to make sure students can get to it. Then you have to make sure they are actually going to read, watch, and/or listen to it! There are many ways to help ensure the type of engagement you are hoping for. These resources will help with both of those challenges. Enhanced Use of Class Time – This is one the biggest reasons WHY teachers flip their classrooms – to change how they use classroom time. These tools will help you get students active, hands-on, thinking, questioning, and collaborating. They’ll be so busy getting into what they’re doing and interacting they won’t even know their learning! Overcoming Obstacles – Yes, there are obstacles to be dealt with. Technology challenges, frustrated administrators, and reluctant parents to name a few. Here are some resources that can help. Continuing YOUR Learning Journey as an Educator – Digital learning doesn’t end with the flipped classroom, and neither does your professional development. How do you keep up with this ever-changing world? Here are the resources you need to keep up. this will be a big help for all educators to try the flipped learning model. Thank you for this free resource! Thank you for collating this resource; it is a fantastic resource. Tks! That’s a very useful gift!